While the colors of a 1950s bathroom were deemed cheerful and progressive at the time, these two-toned bathrooms can now seem small and outdated. 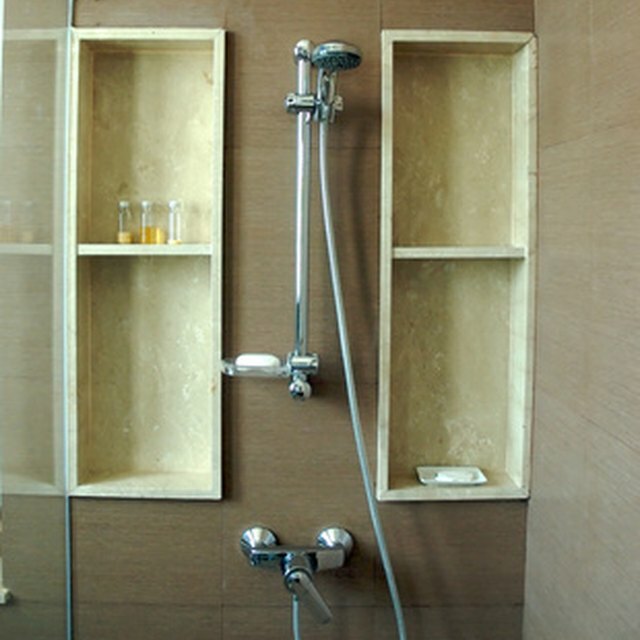 Remodeling a small, 1950s bathroom can provide homeowners with a more user friendly and stylish space. Shut off the water to the bathroom at the house's main water source, and turn on the sink and shower faucets to drain the water from the lines. Flush the old toilet to drain the tank. Remove the bolt caps from the toilet where it meets the floor, use a wrench to unscrew the bolts, and lift the toilet from its base. Unscrew the sink faucet valves, and use a wrench to unscrew a wall hung or pedestal sink from the wall. Unscrew the shower head, tub filler from the wall of the shower, and use a screwdriver to unscrew the valve face plate. Tear out the old tile with a hammer and either a chisel or a utility knife. Hold the knife at a 45-degree angle from the tile, and hit the handle with the hammer to break the tile away from its setting material. Remove both the tile and the thick mud setting material used in bathrooms in the 1950s, which may take several passes with the hammer and knife. Tear out the old bathtub by first loosening the adhesive along its edges with a utility knife. Heat the adhesive with a heat gun or hair dryer if the adhesive holds fast. Take the measurements of the previous fixtures to ensure proper fitting of new fixtures. Purchase the sink, toilet and tub together as a set from a manufacturer's line to achieve an updated and cohesive design. Select tile that is either 12 inches in size, or mosaics of 2 inches or less in size for the bathroom floor. Both large tiles and mosaics visually enlarge small spaces because they do not form a tight grid the way that 6- or 8-inch tiles do. Select a tile for the shower walls in a coordinating color to the bathroom floor to help visually enlarge the room and update the design. Leave the bathroom walls bare of tile wainscoting. Install the new tub, using adhesive to cement it into place, and install the shower valves, tightening them into place with a screwdriver. Replace the tile backerboard and sheet rock throughout the room, nailing them into the studs of the walls with a hammer. Install the bathroom floor and shower wall tile by spreading a thin layer of thinset mortar into place with a trowel. Place the new toilet, shower head, tub spout and shower valve face plate over the finished tile. Use a wrench to tighten the bolts of the toilet into place, and a screwdriver to tighten down the shower valve face plate. Install the new sink by using a drill to bore holes into the wall and a wrench to tighten the screws. Hook up the new faucets and other areas of water in the room by attaching them to the valves and tightening them down with the wrench. Turn on the water to test for water pressure and leaks. Install metal bathroom accessories by using a drill to bore into the finished walls, and using a screwdriver to attach the escutcheons to finish the design update and increase the bathroom's functionality. Use cool colors in the small bathroom design to help visually enlarge the space. Cool colors such as blues, grays and whites recede from the eye, which will help make the room appear larger. Installing a shower door will also help to update the design, as well as keep the room's feel open.